Spring is officially here, and the Smokies come to life with fishing and outdoor activities, great food, and wildflowers galore. You may fish year-round in the Great Smoky Mountains National Park. Park streams are home to 67 species of fish in 12 different families, although the brook trout is the only trout species native to the Smokies. Refer to the Park website for size limits, possession limits, time for fishing, lures, and equipment restrictions. Due to the danger of introducing non-native aquatic life, which are a threat to the native species and ecosystem, bait fishing is prohibited. License requirements vary between the state of Tennessee and the city of Gatlinburg, which requires a special license. You can buy Gatlinburg licenses at Gatlinburg City Hall, Ace Hardware, Old Smoky Outfitters, and Smoky Mountain Angler. Presented by Bush Brothers & Company, you don’t want to miss this tasty event held on the streets of Gatlinburg. Held Thursday, May 12 from 5pm to 8pm, there will be Appalachian musicians you can listen to, unlimited amounts of beans and cornbread you can sample (covered with your $10 registration fee, for sampling only), and a local cookoff competition you can watch. What better way to enjoy the vibrant colors of spring than to take part in the wildflower pilgrimage. Gain access to researchers, botanists, and flora/fauna enthusiasts on your journey. There are over 150 programs available including guided hiking tours and walks. Come learn all about the varieties of wildflowers, plants, and the animals native to the Great Smoky Mountains. Held from April 19 – 23 in 2016, it’s certainly going to be an experience make your vacation blossom. You can get more information and register at the event website. Register on-site in the Mills Conference Center in Gatlinburg beginning April 19. Participate in cleaning up the Great Smoky Mountain National Park during the Spur Clean Up on Tuesday, April 19, 2016, from 9am to 12pm. Businesses and corporations are urged to create teams, because Big Daddy’s Pizzeria will award a company pizza party to the team that collects the most trash. No team? Well that’s okay, because you can get free ice cream for participating, courtesy of Ben and Jerry’s. Planning a visit from outside the area? Bring along used adult and children’s clothing and donate them to ministries at the GCVB office on April 20 from 8am to 6pm. 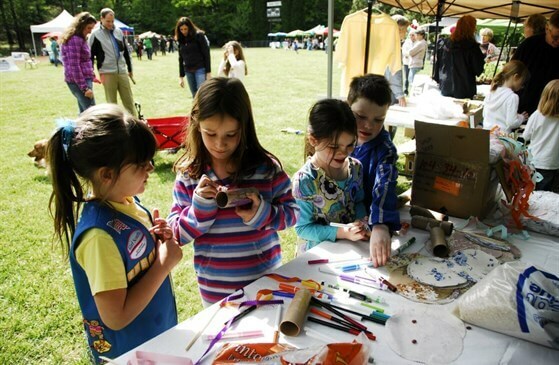 Enjoy the free Earth Day Festival at Mynatt Park on Thursday, April 21, from 3pm to 6pm. Your family will enjoy activities, games, crafting, and the live music. While you’re there you can learn how to be green. Can you imagine anything better than an evening stroll? We can… a 5K! The fourth annual Earth Day 5K event provides a fun opportunity to contribute to the Gatlinburg Chamber of Commerce Foundation’s initiatives in education and green programs. The USA Track and Field sanctioned event will be on April 22, 2016, at 10pm. You can register online here or on race day at 8pm at the Nantahala Outdoor Center. There is a benefit to registering early online—digital door prizes drawn every Friday!